Hilton Head Island is bursting with activity this summer. And as Hilton Head activities heat up with the weather, now is the time to take advantage of the beaches, tennis courts, and most of all, great golf that Hilton Head has to offer. In conjunction with our friends on what is often called Golf Island, we’ve put together an itinerary for a memorable long weekend. Begin with your arrival at the charming Savannah/Hilton Head International Airport (SAV). It’s less than an hour’s drive from Hilton Head and gives you the chance to take in the striking vistas that unfold as you drive over the bridge onto the island. Next, check into your accommodations at Palmetto Dunes Oceanfront Resort. It features three miles of pristine beachfront ideal for tossing a football or just relaxing in the sun. And with a top-rated tennis center, 11-mile lagoon for kayaking/canoeing and three championship courses, Palmetto Dunes is the ideal home base for your Hilton Head golf vacation. Send me more information about Palmetto Dunes! Haig Point’s award-winning course is close by the ocean. After settling into your villa, head over to the Signature Course at Haig Point Club. Recently refurbished and enlarged, this 20-hole course has been ranked by Golf Digest among “America’s 100 Greatest Golf Courses.” Golf Magazine has named it a “Top 100 Course in the World.” However, if you’re feeling a bit tired from the travels, opt for The Osprey Course, an entertaining 9-hole option. Following your round, loser buys dinner at Scott’s Fish Market, conveniently located just outside the main entrance to Palmetto Dunes in Shelter Cove Harbour. This waterfront restaurant has been an island staple for almost 30 years and features fresh local seafood, hand-cut aged steaks and homemade pastas. Cap off the evening with a homemade Italian ice from Frosty’s. Spend the morning taking advantage of the many amenities right in Palmetto Dunes. Grab a light breakfast at The Dunes House, where you can dine beachside. You needn’t leave the resort to play your first round of the day. Challenge yourself and pick up 18 holes at the George Fazio Course, or play the Robert Trent Jones Course for some fabulous ocean views. Venture out of Palmetto Dunes to Chow Daddy’s en route to your second tee time of the day. This casual restaurant uses fresh, local and organic foods to create delicious dishes such as the brisket burger, traditional pork bun and fried chicken breast. Be sure to order some grilled buttermilk jalapeno cheese cornbread for the table. Send me more information about Palmetto Dunes! Sea Pines, known for its water views, has cool shade, too. After you’ve recovered from your food coma, continue the scenic drive to Harbour Town Golf Links which is set within The Sea Pines Resort. The iconic course hosts the PGA Tour’s only South Carolina tournament–the RBC Heritage Presented by Boeing–each April. The crowning achievement of famed designer Pete Dye and design consultant Jack Nicklaus, this layout places a premium on finesse, imagination and shot making, rather than strength. Send me more information about Sea Pines! Sea Pines’ iconic lighthouse shows the way. Following your round, take some time to visit the Harbour Town Yacht Basin, home to the distinctive red-and-white striped Harbour Town Lighthouse. Here you’ll discover a variety of stores and restaurants and a full range of watersports. Multiple ice cream options make it difficult to say no to a pre-dinner dessert. If it’s a clear day, take a tour of the lighthouse for distant views of the island and Calibogue Sound. Then, visit Sea Pines Beach Club for dinner accompanied by stunning vistas of the Atlantic Ocean. Make the short trip across the bridge to nearby Bluffton. Begin your adventure with an early round at Hampton Hall. The Pete Dye Signature Course is artfully designed with five sets of tees, and can be played from 5,329 to 7,503 yards. Send me more information about Hampton Hall! Take in the panoramic views in early light as you play through this unique course. Grab a quick bite at the clubhouse before venturing to your next stop: Palmetto Bluff. Hampton Hall is known for its Pete Dye Signature Course. Palmetto Bluff’s May River Course, designed by Jack Nicklaus in 2004 and named Best New Course in 2005, is an impeccably designed treat for beginners and pros alike. From the eco-friendly turf right down to the sand traps, this course has been meticulously developed for optimal play. Take note of its riverside location which offers pleasant water views from every hole. After 36 holes of golf you’re sure to be hungry, so stop off at Old Town Dispensary in Bluffton for good food and a relaxing atmosphere. Happy hour specials run from 4 -7 p.m. (Monday–Saturday) and include $1 tacos and $6 dozen wings. Featuring outdoor seating, fire pits, delicious food and the occasional band, OTD is where you can fully embrace vacation mode. Send me more information about Palmetto Bluff! Close out your trip with 18 holes at Hilton Head Plantation. 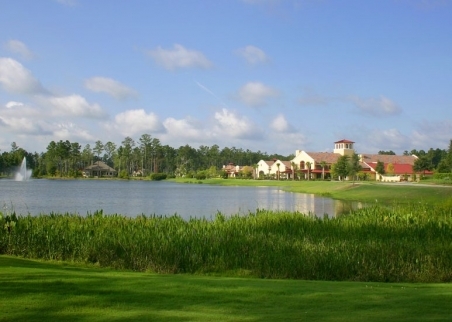 The community, one of Hilton Head’s largest, features two public and two semi-private courses. Play a round at Oyster Reef Golf Club, the Rees Jones designed course. The course’s clever design is both delightfully challenging and one of the most aesthetically pleasing on the island. Scenic beaches are guaranteed at Hilton Head Plantation. Treat your group afterward to Skull Creek Boathouse located just outside of Hilton Head Plantation. Their local brews and live music on the patio during sunset are the best way to conclude a busy weekend of golf and exploration. Make sure you stay for dessert because their apple fritter bread pudding is a local favorite. Send me more information about Hilton Head Plantation!